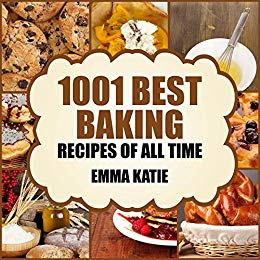 1001 Best Baking Recipes of All Time!Over 1,000 of Mouth Watering Baking Recipes with Easy-to-Follow Directions!Have you ever dreamed about baking scrumptious cakes, luscious cheesecakes, crunchy cookies and healthy muffins?! How tempting does Nutella Banana Tart or Brownie Cheesecake sound?! If just the thought of those desserts tingled your taste buds, you’ve come to the right place! This book is just what you need to get you started towards learning what baking is, how it works and how it can be done at home without much hassle, professional equipment or any special baking skill.Baking has evolved so much the last couple of years. It went from the very basic flour and water mixture Egyptians used to make centuries ago to the famous French desserts, layered and texturized cakes, crisp and crunchy cookies, moist breads, complex cupcakes, delicious muffins and creamy cheesecakes. And the best of all – you don’t need to be a professional to enjoy all of this! Home baking is now easier than ever, not just because the equipment is cheaper and cheaper, but also because you have books like this to help you dive into this amazing world of desserts!Collecting 1001 recipes between its pages, this book aims to be a complete dessert guide for the home bakers. Being in 11 chapters, the book covers every dessert you can think of, from the very simple blueberry muffins to the more complex red wine chocolate cake or lemon meringue pie. In addition to this, it also includes a chapter focusing on the basics of pastry – such as Genoise sponge cake, Madeira cake, pie crust or pate a choux. Wait no more! Download your copy today and start baking your way to your family’s hearts! No more money spent on little snacks or cakes from a bakery. Now you can bake your own at home and put a bit of love in each and every one of them. Put your apron on and let’s get baking!